It's time to round up your files. Get Wrngl. Wrngl (pronounced “wrangle”) is designed for people who make things - architects, builders, designers, musicians, engineers, and anyone else who needs to share and track critical information about files with collaborators. Wrngl was originally developed as a tool for an architecture firm, to track the revisions of numerous files across several groups of stakeholders during the design and construction phases of a project. It has grown up a lot since then, and now Wrngl is a beautiful, secure and easy-to-use platform for file sharing, revision tracking and document review and approval. Wrngl makes managing and tracking blizzards of project files easy and intuitive. Project managers can create their own templates and invite internal and external users with nothing more than an email address, making project setup a snap. Users can also create custom statuses for their organizations, making notifications match their organizations’ own processes and lingoes. Project structures and document statuses are fully customizable. Use one of our templates or make your own. Actions are tracked, logged and color coded. Setting up project team members is fast and easy. Learn more about how Wrngl works by visiting the FAQ page. Many file management websites are just FTP sites with a pretty face. Others use an archaic folder metaphor from the last century for their interface. Wrngl's interface is clean, simple and beautiful. And unlike many other management and file sharing products, Wrngl doesn’t charge you an ever-increasing fee for each user every month. With Wrngl you pay a flat monthly fee for your entire organization and all of your external collaborators. We invite you to explore Wrngl for yourself with a free trial project! Wrngl is primarily a file sharing and revision tracking platform, originally developed for architecture and construction. Wrngl is useful for any organization or group that needs to share files, track revisions of those files, and update team members about revisions. Users can also setup custom templates for projects and statuses, allowing for tailoring to an organization’s specific processes and needs. Wrngl is not bloated project management software with a complicated interface and useless features you don't need. It is a beautiful and easy to use web portal to securely organize and track the many files used by the various team members for collaborative projects. If you are tired of shotgun emails, Wrngl is for you. Wrngl was designed for an architecture firm to collaborate with contractors, sub contractors and customers on design and construction projects with numerous files. Wrngl has since broadened its appeal to any group that needs to share large and/or numerous files and track them carefully. This makes Wrngl appealing to engineers, designers, musicians and music producers, property developers and managers and many other professionals. What makes Wrngl better than other management platforms? Wrngl has a couple of distinct advantages over some other project management systems. Wrngl is simple to use and beautifully designed, making it a pleasure rather than a burden to interact with. Wrngl does’t take over your professional life like so many other products by invading your calendar, sending unnecessary updates, forcing you to use a message board and over-managing your work. 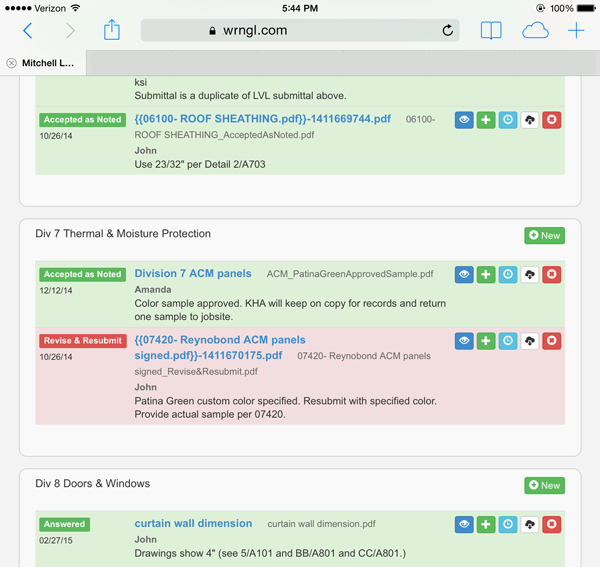 Wrngl is fully customizable - instead of attaching transmittals and forms with boilerplate language to files, project managers can easily customize the interface for project users to reduce paperwork and save time. Lastly, Wrngl costs a fraction of what many other similar products charge, potentially saving organizations hundreds or thousands of dollars annually. How much does Wrngl cost? Wrngl has four different plans, based not on cost per user, but on the number of projects that an organization needs to run simultaneously. The FREE plan allows an organization to test the product on 1 project. No time limit. No user limit. A BASIC plan will allow an organization to run up to 10 projects concurrently at a cost of $50/month. The BIG plan allows up to 25 projects and costs $100/month. Lastly, the BIGGER plan allows virtually unlimited projects for $250/month. All plans allow unlimited users. Furthermore, there are no add-ons or additional hidden costs! Yes! A person can only access Wrngl if they have been invited by an organization’s administrator. Users control their own login and password information. As far as billing, Wrngl is integrated with Stripe, one of the premiere payment processing platforms on the web, and no payment information is stored outside of Stripe’s secure environment. What do I need to signup? All an organization needs to get started is a valid email address for someone to setup the account, as well as a credit card. A credit card is required for the free plan, but it will not be charged unless the account is upgraded to a paid account. Absolutely! Wrngl was designed for use primarily on a tablet or computer screen, but it is fluidly responsive, so it will also work on phones. What browser is required to operate Wrngl? Wrngl works in the latest versions of all of the most common browsers such as Chrome, Internet Explorer, Safari and Firefox.